Company History | Water Gremlin Aquila Company S.p.A.
Aquila Piombo was founded in 1965, soon after became one of the most important producers of Lead shots for hunting and sports practices in the European market, focusing on high quality and specialized products. Since the start of its activities Aquila Piombo was characterized by the aim of always looking for new solutions and its efforts brought to the development of the famous Palla Aquila (cal. 12, for wild boar hunting) that was patented. Early 1980s, starting from the knowledge of Lead working, Aquila Piombo started to develop a new technology for the production of a fundamental component for the batteries In collaboration with Varta in Germany, a new Lead bushing was developed and the process to Cold Form this product was patented. Since then Aquila Piombo has continued to grow becoming one of the main producers of cold form bushings in the world. This special technology has the advantage of realizing a component with no porosity and with a very smooth surface that creates a perfect bounding with the plastic after the co-molding of the lid/cover of the battery, this avoids any risks of acid leaking from the terminal of the battery. September 2007, Water Gremlin Co., (USA) Division of Okabe LTD Tokyo, Japan acquired Aquila Piombo expanding our technology for international growth. 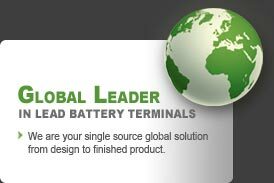 July 2009, Aquila Piombo name was changed to Water Gremlin Aquila Company S.p.A.
Today Water Gremlin Aquila Company S.p.A. (Europe) and Water Gremlin Co., (USA) have expanded their technological knowledge together and now is the market leader in lead battery terminals.